surveillance, in which instance it was discovered that a CCTV security system was fixed around his home, police say. The first wife of Madush was found there in his house. She has wailed and shouted about her husband deserting him and taking away the child, expressing her deep sorrow in that connection. As her child has been taken away by Madush to Dubai, she has pleaded with police to get the child down. Whatever it is, nothing suspicious has been found in the house. Meanwhile, during the inspection process, a deluxe vehicle was recovered by police parked at a Mirisse hotel in Weligama belonging to tele-actor Ryan Van Royan who was arrested in Dubai. Police are suspicious that before Ryan Van Royan turned into a tele-actor he has maintained close connections with Madush and the latter's accomplices for quite a long time and may have used his popularity as a shield for this narcotics dealings. A person named Anushka Kaushal alias Janga too was apprehended in Dubai and when his house in Gandara came under inspection by police, police were able to take into custody articles such as a set of clothes similar to Army uniforms, three Cama clothes, two head gear of the Army, two belts, 32 T 56 bullets, 11 other bullets, 37 empty bullets, five SIM cards, a laptop and other things. janga's father's brother has been taken into custody on suspicion for the offence of keeping such articles in his possession. The house belonging to Madush and his friends situated within Matara district and houses of their relatives was taken into police custody and the hotel belonging to businessman Mirisse Sunshine Suda was subjected to inspection yesterday (8) by police. 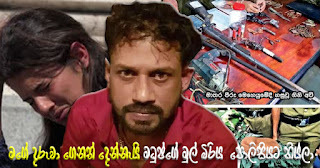 The day before, when the house of Amal Perera in Maharagama and the house of Ryan Van Royan in Dehiwala was inspected, Police took into possession suspected tools used for weighing heroin which are suspected to have been utilised for use of heroin when inspecting their houses. Ryan Van Royan's brother who was arrested was released after being interrogated. Inquiries are continuing.